Fall is here, and September is going on record as one of the wettest, dreariest Septembers in the DC area. 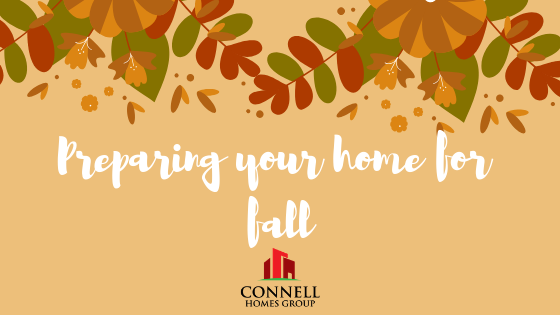 The rain should be clearing out, and this weekend will be a great time to get a jumpstart on prepping your home for the fall and winter before the cold weather sets in. Whether you’re thinking of selling your home in the spring, or just want to keep your property value up, seasonal home maintenance is important! Clogged gutters can lead to thousands of dollars worth of water damage to your roof and foundation, flooding your basement, and ruined landscaping. Make sure to clear out old debris, and to check the gutters again after all the leaves have fallen. Gutter guards are a great add-on and will help keep the gutters functioning, with less upkeep later. While you’re up on the ladder cleaning the gutters, you can also inspect the roof and chimney. Grab some binoculars to help you get a good view. Keep an eye out for missing or damaged shingles, and granules in the gutters–this is a sign the coating is wearing off and you will have problems soon. Check the chimney for loose flashing or cracked and/or missing mortar. Once you do your final mowing of the season (usually by mid-October), it’s best to drain and store your lawn equipment. Over time, the chemicals in gasoline will change, causing a gunky buildup which can damage your mower’s engine. This is also a good time to get the blades sharpened so it’s ready to go next spring. Fall is a great time to fertilize your lawn, to strengthen the blades and roots, and ensure a healthy green lawn in the spring. October is also time to plant the bulbs you’ll want to sprout when the snow starts to melt. Tulips, Lilies, Daffodils, Hyacinths, and Crocuses will add some ROYGBIV to your garden come April! Cracked and uneven pavement is dangerous enough in good weather, but throw a layer of ice and snow on top, and you could be in for a painful reminder to have it fixed. It’s best to take care of those issues now, while the weather is still warm enough to fill the cracks and the ground is soft enough to adjust the pavers. Don’t forget to check and secure loose handrails too! Fall is a good time to clean your equipment and re-organize your tool shed. Start by moving the summer equipment to the back–lawnmower and trimmers, gardening tools, pool toys, etc. Make sure the items you’ll need for fall and winter are in easy reach. This would include the rakes and leaf blower, snow shovels, and a snowblower. Fall is also a great time to stock up on ice melt and make sure the ice scraper is in your car! Before the first freeze, you want to make sure to turn off any outdoor plumbing that has separate shut offs, and winterize the faucets. This will prevent burst pipes and expensive repairs. Foam faucet covers are as inexpensive as $3 and take seconds to put on. Lower your heating bills this winter by getting rid of drafts. Weatherstripping can wear down over time, allowing cold air in and warm air out. Check your windows and doorways by slipping a piece of paper between the entryway and the door and closing. If it slides through easily, it’s time to replace the weatherstripping. It’s good practice to have your HVAC serviced annually by a professional. They will check for loose or worn belts and ensure the motor is running properly. This will ensure your unit will keep chugging along all winter! Also, it’s a good time to change the air filter. Typically, you should replace the air filter every 90 days, so a good reminder is to change on the first day of each new season. Who doesn’t love the smell of a fire on a chilly fall evening? Even if you only use your fireplace occasionally, you should have it inspected and cleaned regularly to prevent dangerous fires. Professional chimney sweeps will clean the creosote (the gunky film produced by burning wood), make sure the flu is clear of blockages such as birds nests or other debris, and check the chimney for damage. You should also open and close the damper to ensure it is in proper working order. At least twice a year, you should plan to check the safety features in your home. A good day to remember this is the changing of the clocks for Daylight Savings Time (Sunday, November 4!). Change the batteries and test your smoke and carbon monoxide detectors. Check fire extinguisher indicators on the pressure gauge to make sure the extinguisher is charged, the pin is firmly in place, and the nozzles are not clogged. Finally, create a family fire escape plan, or review the one you already have.